LIVE IN CARE AGENCIES IN LONDON - See here who the best are! Live in care is when an agency provides you a single carer to take care of your loved ones, in their own home. The carer lives in the home so is there 24 hours a day. This is normally the best option for families and the person in need of care as it allows them to continue most of their normal life and daily routine. Here is a useful video from Elder that explains what Live in Care is. 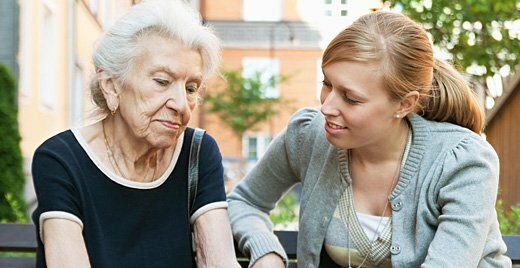 What does a live in care provider in London do? Here is a short video that explains what a live in carer does. Live in care providers and carers in London are there to help your loved one continue their normal life. This means they help with a range of things, from performing household chores, to cooking, helping around the home, and looking after pets. For those that need personal care, carers also help with giving medication, bathing, dressing & toileting, and prevent loneliness. Are you looking for a Live In Care provider in London? We can help you shortlist a provider that is likely to be a good fit for you in terms of costs and services. Have a chat with robot below and see if he can help you find someone. It will take you about 3 minutes! Give it a go, you will be surprised! Press ‘Yes’ below to start. What areas In London can you find a live in carer? How do you choose a live in care provider? The first thing you should do when researching providers is to check their quality with the CQC (the Quality Care Commission). This is the body that regulates providers. If they have an outstanding rating, then contact the provider and ask them a range of questions about their agency and how they go about their business. If they sound good, then arrange to meet up with them and go from there. Don’t be afraid of speaking to multiple agencies at once and trialling them before settling on one. This is a very personal decision after all. What makes a good live in care agency in London? A good agency will make sure that not only is your loved one looked after, but also that you are given regular feedback on their performance. A carer should be enabling your loved one to continue as normally as possible, noting down the activities they perform, and the agency should contact you regularly with how the care is going. 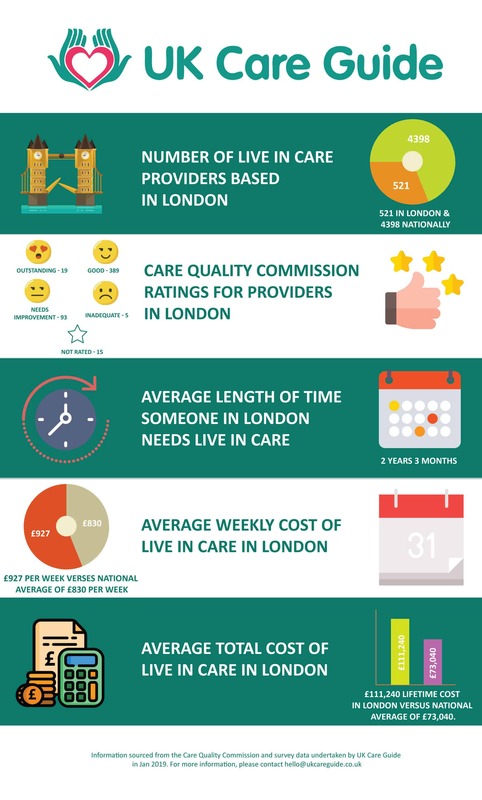 What does live in care cost in London? Costs for live in care vary greatly, due to the amount of individual care each client needs. It’s also worth bearing in mind the London premium for services. During our research we’ve found the cost averages from £800-£900 per week and up to around £1,500 if the carer is looking after 2 people. When you first speak to a agency they can give you some idea once you’ve given them details of the care needed, but it’s always worth shopping around! Here is a short video that tells you about live in care costs. Not only is it important to make sure an agency is given an Outstanding award from the CQC, but also that the agency understands the specific needs of your loved one. You should make sure to make the provider aware of the exact conditions of your loved ones care so that they can make the best choices in the carer they choose for you. How fast is the process of getting live in care? Most providers can start their services within a week or two of you first contacting them. If you know the exact services you need them to perform and are certain on the care provider you want to use then the process will be very quick indeed. The first thing you need to do is figure out the exact services your loved one will need from a live in carer. Do they just need some help around the house, or are their needs more intensive such as bathing and dressing? Once you’ve done this, phone an agency and ask them any questions you might have. At this point they may arrange a further phone discussion, or for you to come into their branch for a chat. Which training do home care staff get? While there are many training courses for carers, the most generally respected one is the Care Certificate, which is recognised by the CQC. Most agencies provide this when carers start a career with them. It is worth asking a provider when you contact them if their carers have undergone this training. If not, ask the exact skills and knowledge they have learned. Are staff from Live in care agencies in London insured? Any agency that cares about its business will have their staff and their clients fully protected. This means their staff should be insured for both personal and public liability. This is something you should ensure to ask about when contacting an agency. Do Agencies follow up on their carer and client? A good agency will make sure to follow up fortnightly, or weekly if the care is especially intensive. This way you can be made aware of how the care is going, and if there are any changes that need to be made on either party’s side. We have listed below Live in Care agencies that operate in the London area. Elder prides itself on making sure that all their carers enable the people they care for to continue living their lives in a healthy way, without making changes to their routine. This agency has provided home care services for their clients since 2009. They have since won multiple awards, including Health investor’s Domiciliary care provider of the year in 2018. They’re also rated as outstanding by CQC since 2016. This agency was created by Ken Waterhouse, in 2011 after helping his mum care for his terminally ill father. As a result it’s an agency that strives to help families with every stage of the process of finding a carer. Bluebird Care, based in Westminster leads the field in their customer services and quality of care with a triple outstanding rating from the CQC. Helping Hands has been in business since 1989, so has a lot of experience to draw from when it comes to caring for their clients and have won multiple awards as well as holding an outstanding rating from the CQC. This post can also be found on our Google+ page.